It is known that ‘Leeds House’ was around in 1882. Part of the history of the building was told in 1962 by a member of the family in whose possession the building had been for two centuries. Mrs. Mildred Pywell of Shipley said at the time that the Leeds House had once been two cottages, one of which was occupied by her great-great-grandfather, Thomas Fieldhouse, who died in 1867 aged 82. It was her grandfather, William Fieldhouse Freeman (who died 1886) that had the idea of converting the cottages into one building as refreshment rooms for market visitors and the first tenant was John Hoyle. 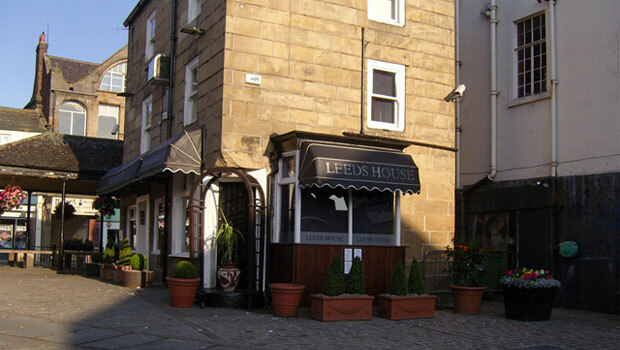 Mrs. Pywell said the name “Leeds House” was given to the premises about the time it got its licence in 1882 by a Leeds Man who came to Otley every market day to stand with a stall in front of the house. When the chance came the man, Mr. Ben Threapleton, became tenant under her father, and it was he who gave it the name. Permission for the Licence was granted on the understanding that the premises should be conducted as a very orderly house. At one time a corner of the property was a little shop occupied by a butcher and later used as a sweet stores. This was taken into the refreshment rooms to increase accommodation. The first few landlords were the before mentioned Ben Threapleton in 1882, John Phillips in 1888, and Thos B. Houseman from 1898 to circa 1908 when he left and went to the Black Bull. There have been several more tenants but in December 1961 the decision for the Council to purchase the building for £6,000 was passed. Last orders were called in the public house on 7th March 1962. It re-opened on the 7th March 1963 as Leeds House Café with Jack Hollings as proprietor. It remained as a café until 1992 when the property was then put up for sale in 1993. It remained empty for a few years until it re-opened as Martins Refreshment Rooms in 1997 but closed very quickly thereafter. Again, it re-opened as Leeds House Café around December 2004 and still remains there in 2011.